This isn’t the first time the premier class title fight has gone down to the last race of the year - many a title was decided at the close. Since the world championship series was introduced in 1949 there have been sixteen previous occasions where the premier-class title has been decided at the final race of the year, two coming in the modern MotoGP™ four-stroke era. 1950 – Going to the final race of the year at his home race at Monza, Umberto Masetti, riding a four-cylinder Gilera, had a marginal lead in the championship over Geoff Duke riding a single-cylinder Norton. Geoff Duke won the race, but Masetti did just enough by finishing second to clinch the title by a single point. 1952 – Again Umberto Masetti arrived at the final race of the year with a narrow lead in the title chase, this time over the 1949 champion Les Graham (MV Agusta) and Irishman Reg Armstrong (Norton). Les Graham won the race, which took place over 48 laps of the Montjuich circuit in Barcelona, but once again Masetti did enough to clinch the title by finishing second. 1957 – Libero Liberati (Gilera) won the final race of the year at Monza to take the title from Bob McIntyre (Gilera). Liberati had crossed the line first at the Belgium GP earlier in the year, but had been disqualified for changing his machine without notifying the officials. After the end of the season Liberati was re-instated as winner of the Belgium GP, meaning he had in retrospect won the world title before arriving in Italy for the final race. 1966 – Two of the greatest rivals of all time Mike Hailwood (Honda) and Giacomo Agostini (MV Agusta) were neck and neck arriving at the final race of the year at Monza. The two rivals battled for the lead early in the race until Hailwood’s Honda failed, allowing Agostini to cruise home to take the first of his eight 500cc world titles. 1967 – In a repeat of the previous year, Hailwood and Agostini went into the final race still battling for the championship as the grand prix competitors visited Canada for the one and only time. Hailwood won the race to give him the same points total as Agostini, each having won five races. Agostini took the title due to his three second place finishes to Hailwood’s two. 1975 – Giacomo Agostini was once again involved in a final race shoot-out with a British rider, this time it was Phil Read, who had taken over as the number one rider at MV-Agusta and won the title for the previous two years. Read won the final race of the year at Brno but Agostini, riding a Yamaha, cruised home in second place to clinch the title and become the first rider ever to win the premier-class crown on both two-stroke and four-stroke bikes. 1978 – Kenny Roberts (Yamaha) had just an eight-point lead over Barry Sheene (Suzuki) going into the final race of the year at the old 22 km Nurburgring circuit. Roberts finished in third place, just ahead of Sheene, to become the first American rider ever to win the premier-class title. 1979 – Kenny Roberts once again arrived for the final race of the year battling with a Suzuki rider for the world title, this time young Italian Virginio Ferrari, at the Le Mans circuit. After leading in the early stages of the race Ferrari crashed out, which gifted the title to Roberts for the second year running. 1980 – For the third successive year a Suzuki rider was challenging Kenny Roberts for the world title, this time it was fellow American Randy Mamola and the circuit was once again the old Nurburgring circuit, the final time that this famous track was used for Grand Prix racing. Even though Mamola led the race in the early stages, Roberts always looked the favourite to take the title having only to finish in eighth place or higher. Mamola’s challenge evaporated mid-way through the race when he was slowed with mechanical problems. 1981 – For the second successive year Randy Mamola arrived at the final race of the year, this time held at the Swedish Anderstorp circuit, with a chance of the title. Marco Lucchinelli was the rider leading the classification and he needed to finish fifth or higher to take the championship if Mamola won the race. The race was held in mixed conditions with light rain falling and after leading early in the race Mamola fell steadily back through the pack and out of the points while Lucchinelli cruised home to a safe ninth to take the title. 1983 – Freddie Spencer (Honda) had a five-point advantage on Kenny Roberts (Yamaha) when they arrived at the final race of 1983. Throughout the race, held at the Imola circuit, Roberts attempted to slow Spencer down to allow his teammate Lawson to catch up and possibly finish ahead of Spencer. At the final flag Spencer managed to take the second place needed to clinch the title and become the first Honda rider to win the 500cc crown. 1989 – Once again two American riders arrived at the final race of the year with a chance of the title, this time it was Eddie Lawson (Honda) and Wayne Rainey (Yamaha). Lawson finished second in the race to clinch the title after a tremendous battle with Rainey and fellow American Kevin Schwantz, who won the race. 1992 – Mick Doohan (Honda) suffered severe injuries in a crash during practice at round eight in Assen, by which time he had a 65-point lead over Wayne Rainey (Yamaha). When Doohan returned to compete at the final two races of the year, still far from fully fit, Rainey had reduced the lead considerably so that when they arrived at Kyalami in South Africa for the final race of the year Doohan had just a two-point advantage. In spite of Doohan’s heroic efforts to finish in sixth, Rainey took a safe third place to win the title by four points. 1993 – Strictly speaking this was the last time that the 500cc title went to the last race of the year with Kevin Schwantz (Suzuki) leading Wayne Rainey by 18 points. However in reality Schwantz had won the title two races previously at the Italian GP when Wayne Rainey suffered a crash that ended his racing career. 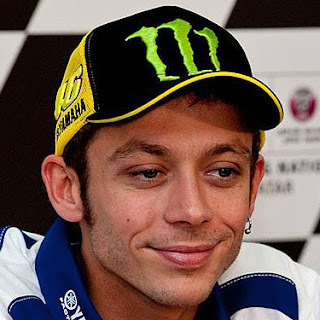 2006 – Valentino Rossi (Yamaha) arrived at the final race of the year with an eight-point advantage of closest rival Nicky Hayden (Honda). Troy Bayliss, standing in for injured Sete Gibernau, won the MotoGP™ race in front of Ducati teammate Loris Capirossi in a first ever one-two for the Ducati factory. Nicky Hayden filled the final podium place to become the last world champion of the 990cc era, after Valentino Rossi had crashed on lap five and restarted to finish 13th. 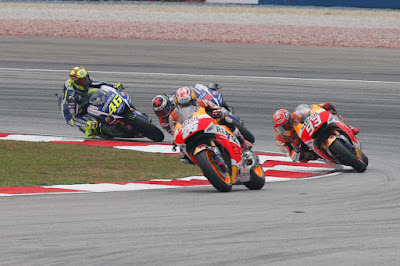 2013 – Marc Marquez had a 13-point lead over Jorge Lorenzo arriving in Valencia for the final race of the year. Lorenzo won the race, but Marquez finished third to clinch the title in his rookie season in the MotoGP™ class.